My goal is to make the best possible knife sheath at a reasonable price. The sheaths are cut, punched, dyed and stitched entirely by hand. Most are made of top quality 7 ounce oil tanned harness leather and hand stitched with 4 cord waxed linen thread. There is no better way to hold two pieces of leather together than hand stitching. Sure, machine stitching is faster but it does not have the holding qualities of true hand stitching. My sheaths are constructed in layers...most type C sheaths consist of 9 pieces while most Type A sheaths are seven pieces. Overlapping pieces are sanded down to a feather edge to eliminate bunching and make for a smooth transition. Most of my sheaths (unless made to repro specs) have a full blade length welt layer to provide a "pocket" for the knife blade and protect the stitching. . Below is a pic of the throat section of one of my sheaths. It is 6 layers at the throat and approx. 5/8" to 3/4" thick. The welt layer is double thickness leather to accomodate the thickness of the blade. 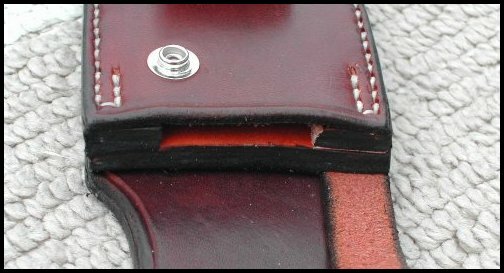 I use a "hilt holdoff layer" at the top of the throat to keep the hilt and guard from rubbing excessively on the loop section of the sheath. Edges of the sheaths are sanded smooth and even, dyed with edge dressing and rubbed down with a mixture of parafin and bee's wax for a smooth finish. Neatsfoot oil is then applied and a final application of Mink Oil finshes the sheath. There is no artificial glossy coating to hide the great feel of the leather. Snaps can be nickel, gun metal black or antique bronze. Many of my sheaths are shown on this site but certainly not all of them...just a representative sample. If I don't currently have a sheath pattern for your knife, I can most probably make one. Contact me at the email below with any questions.